HMS Defender is the fifth Type-45 destroyer of the Royal Navy. Image courtesy of the Royal Navy. HMS Defender (D36) is home ported at Portsmouth. Image courtesy of the Royal Navy. HMS Defender was built at BAE Systems' Scotstoun yard on the River Clyde. Image courtesy of the Royal Navy. HMS Defender features Sampson long-range radar. Image courtesy of the Royal Navy. The fifth destroyer of the Type 45 class is equipped with state-of-the art systems and equipment. Image courtesy of the Royal Navy. The gunnery trials on HMS Defender were completed in March 2013. Image courtesy of the Royal Navy. A Lynx maritime attack helicopter was test landed on the Type 45 vessel in October 2012. Image courtesy of the Royal Navy. 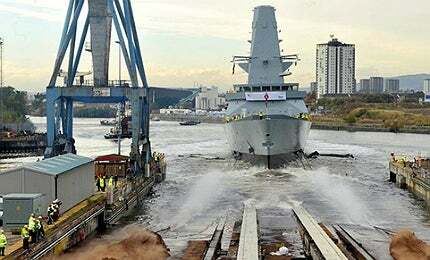 HMS Defender officially entered the operational service with the Royal Navy on 21 March 2013. Image courtesy of the Royal Navy. BAE Systems is the prime contractor for the construction of Type 45 class destroyers, including the HMS Defender. Image courtesy of the Royal Navy. HMS Defender is the fifth destroyer vessel of the Royal Navy’s Type 45 Class Destroyers. It is also the largest and most powerful destroyer in the navy’s fleet. The vessel was delivered to the Royal Navy in July 2012. The vessel is home ported at Portsmouth Naval Base. The Defender destroyer entered operational service with the Royal Navy on 21 March 2013, upon successful completion of extensive sea trials and training. Type 45 predecessors of HMS Defender include HMS Daring, HMS Dauntless, HMS Diamond and HMS Dragon. The sixth and the final Type 45 destroyer HMS Duncan was delivered to the Royal Navy on 22 March 2013 and was operational in December 2013. Type 45 Class destroyers, including the HMS Defender, are deployed for a variety of local area field defence missions such as anti-piracy, anti-smuggling, disaster relief, surveillance and war fighting. Type 45 Class was announced by the UK Ministry of Defence (MoD) in July 2004 with the aim of replacing the Type 42 destroyers that have been in the Royal Navy’s service since 1978. The number of vessels ordered under the latest class was reduced to six, from the originally planned 12 vessels. BAE Systems Marine was appointed as the prime contractor to build the six vessels in the class. "Type 45 Class destroyers, including the HMS Defender, are deployed for a variety of local area field defence missions." HMS Defender has a length of 152m, beam of 21.2m and a draught of 5.3m. The displacement of the vessel is 8,000t. BAE Systems laid down the HMS Defender in July 2006 and launched it at the Govan yard in Glasgow, Scotland, in October 2009. The hull of the vessel was built using 2,800t of steel and covered with 40t of paint. Final construction and systems integration was carried out at the company’s Scotstoun shipyard on the River Clyde in Glasgow. The destroyer vessel left for maiden voyage in October 2011, which was followed by a series of trials for testing her systems and mission capabilities. These included safety, speed, propulsion, power, manoeuvrability, navigation, combat and weapon systems, as well as radars, sensors and other systems. HMS Defender can complement a crew of 190 personnel. It has 777 compartments, which means a heavy surplus of approximately four compartments for each crew member. "Type 45 Class was announced by the UK Ministry of Defence (MoD) in July 2004 with the aim of replacing the Type 42 destroyers." HMS Defender is fitted with a 4.5MK8 medium calibre gun, two 30mm medium-calibre gun system, two Phalanx short-range machine guns, mini-guns, a Sea Viper surface-to-air missile system and Lynx MK8 helicopter weapons system. The Sea Viper missile system provides all-round defence against aerial threats approximately 70 miles away. HMS Defender can defend against air missiles attacking at supersonic speeds, a group of ships and aircraft carriers. The vessel features an Identification Friend or Foe (IFF) system supplied by Raytheon Systems. The combat management system for HMS Defender integrates the Principal Anti-Aircraft Missile System (PAAMS) developed by Europaams. The combat management system was supplied by BAE Systems Integrated System Technologies. HMS Defender is propelled by two WR-21 advanced cycle gas turbine engines developed and manufactured jointly by Rolls-Royce and Northrop Grumman. HMS Defender can sail at a top speed of more than 30kt. The range of the vessel is approximately 7,000 nautical miles (12,964km). A Lynx maritime attack helicopter was tested for rescue operations aboard HMS Defender in October 2012. The HMS Defender destroyer is fitted with Sampson multifunctional, long-range radar, which provides mid-course guidance by detecting and tracking hundreds of targets at a time. It is also fitted with medium-frequency sonar supplied by Ultra Electronics and EDO Corporation. The UK Royal Navy’s Type 45 destroyers are to replace the Type 42 destroyers, which have been in service since 1978. The Royal Navy has a rich heritage of hydrography and marine surveying that stretches back to the 17th century with the first survey of the British coast for Charles II. Vard Marine Inc. (VARD) is a naval architecture and marine engineering company with offices in Vancouver, British Columbia, Ottawa, Ontario and Houston, Texas. Raytheon Anschütz designs and integrates navigation systems for small naval vessels.